In the past couple of weeks, a few firsts have happened for me. I got my first decision letter about my claim for disability benefits in Northern Ireland, and I did my first public speaking on the topic of “Welfare Reform” and how it affects disabled people. I’m pretty new to the whole topic of disability benefits – although my chronic illness has been getting worse for many years, it’s only in the past 18 months or so that I’ve been disabled in the way that benefits begin to accommodate. I applied for Personal Independence Payment (the replacement for Disability Living Allowance) on the 31st of August 2016, and got my decision letter dated 1st February 2017. Quite a long time between those dates, because of backlogs in the system, a disaster at my first assessment meeting where their laptop died, and me having moved to an accessible social housing apartment in the meantime. 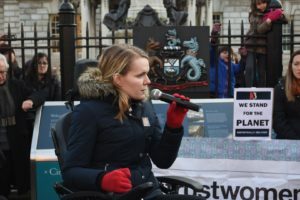 I must admit – when I heard that I’d have a home appointment, I thought I’d have an easy time with my PIP claim, because I assumed that meant they thought I was at least disabled enough to need it. As it later transpired, whether someone in Capita had thought that initially, my assessor evidently did not think so whatsoever, and awarded me 0 points on all categories, and therefore no award of PIP. You can read my decision letter, and my reply to it if you wish – they’re both quite entertaining reads. Starting to appeal this benefits decision has taken a lot of energy out of me already. There’s something particularly difficult about refuting things which are untrue, and decisions based on ridiculous assumptions are strangely hard to argue against. Forming coherent and detailed arguments against someone saying if you can walk 1 metre, you can walk 200 metres is like forming coherent arguments against someone coming up to you and telling your name isn’t your name. However, I’m in a very privileged position to have strong connections to benefits experts, a sizeable Twitter following to ask for advice, and a decent public platform to get points and problems across. But even with that, this system is baffling, nonsensical, and opaque. For the majority of disabled people who these denials happen to, their access to support is lower. Even when the rates of appeal success (in GB) are well over 60%, this is a massive barrier to access. I spoke after a performance of the show Entitled by Macha Productions in The MAC last week, a fantastic theatre piece about the impact of “Welfare Reform” in Northern Ireland, and the unravelling disaster that awaits many people here with the roll-out of PIP and Universal Credit. If you haven’t seen it, I highly recommend it – it pulls no punches about being political, or pointing fingers directly at the politicians and parties who approved “Welfare Reform” in Northern Ireland. I spoke about my own experiences and why I’m running in the NI Assembly elections this year, and about what I think about benefit cuts generally. 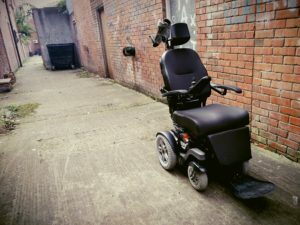 If you’ve been following the introduction of “Welfare Reform” in Great Britain, you’ll have been protest after protest by Disabled People Against Cuts and other groups, protesting because of thousands of people who died shortly after being deemed fit for work, and tens of thousands of people are having their Motability cars and electric wheelchairs taken from them after benefits reassessments. It’s obvious but warrants saying – taking someone’s sole means of getting around safely and efficiently means disabled people are left without mobility, without dignity, and without their human rights. The United Nations is currently investigating the UK Government for, among other things, their implementation of “welfare reform” in GB, and its discriminatory effect on sick and disabled people. The policies and benefit cuts which the UN has so strongly condemned are being introduced almost identically in Northern Ireland, and if you applied for disability benefits after the switch-over date from DLA in 2016, you have no access to any of the cuts’ mitigation measures secured by the Assembly and NI Executive. This particularly disadvantages young people. There are a lot of misconceptions and incorrect ideas about disability benefits. They’re not frivolous extras which grant people free flashy cars or restaurant dining every night – they are key to enabling disabled people to live happy, more independent and fulfilling lives. It’s damn expensive being disabled, and these benefits help level the playing field. They also fill in some of the many gaps left by the NHS in providing care, equipment and other assistance some disabled people need. Taking away someone’s ability to function in society, succeed and be happy is cruel, inhumane, and in this case, unlawful. I firmly believe that the cuts and changes to disability benefits are unlawful, and in breach of the Department for Communities’ obligations with regards to promoting and protecting the rights of disabled people under Section 75 of the Northern Ireland Act. It becomes very dangerous indeed when disabled people are scapegoated as being too expensive and too much of a burden for the public purse. It is not surprising that hate crime, homelessness and suicide are increasing sharply in disabled communities in GB, as austerity slices away at public perception and access to support, hitting disabled people disproportionately hard. When the cost of our care and independence, in the form of DLA and PIP, is decried so loudly on Northern Ireland’s front pages and from the mouths of our elected representatives, it is no surprise that attitudes about disabled people are getting worse. As we see the same deadly cuts implemented in full across NI, we will no doubt see the same horrific outcomes on people’s health, homes and lives. I make no apology for needing extra help to live in this inaccessible world, and will challenge anyone who calls my disabled siblings burdens, too costly, or not worth spending money on. West Belfast, where I’m standing for election, has the highest rate of disability benefits claims per capita in Northern Ireland, a point which has been used by some to paint the broad strokes of “scroungers” and “fakers” on the people of that part of Belfast. We must not forget that Northern Ireland will have higher disability benefits claimants than the rest of the UK for the foreseeable future – we are the product of war, poverty and conflict after all. We should see more people on disability benefits as a good thing – more people that need support are getting it. About 20% of our population is disabled, and much fewer than this claim DLA and PIP. We should be liberalising the system to help more people, not clamping down. Disabled people chained themselves to buses across the UK and blocked roads in the 1990s to get access to public transport. They were some of the loudest protesters against the benefits cuts implemented by Labour, Liberal Democrat and Tory governments in GB, and they have been the loudest campaigners against the ongoing abuses of human rights inflicted by the Department for Work and Pensions in GB, and the Department for Communities here. They will also be some of the hardest hit by the cuts being implemented in Northern Ireland, and their voices will be quietened down by the removal of vital supports. The reality is that disabled people’s lives are being multiply scrutinised, their needs ignored, and their abilities misrepresented to justify the removal or non-provision of the help and support they need. These cuts are ideologically driven, and are not required in a country as wealthy and capable of supporting disabled people as the UK. Northern Ireland has lost its devolution over welfare issues, but this is not an excuse to stop shouting about this. I put quotation marks around “Welfare Reform” because it’s at best a euphemistic name, a sanitised marketing phrase that avoids the harsh reality – welfare cuts, supports removed, lives ruined. An Assembly election is coming up on March 2nd. We are entitled to better than this. Please use your vote on candidates who will not scapegoat disabled people for public spending savings, who support the current “Welfare Reform” programme or who won’t speak up for disabled people in this way. We are entitled to better. Previous Post:What’s with the wheelchair? Hello! I'm Ellen. I'm a trans rights expert and community-building nerd, and run several trans rights and community projects in Northern Ireland. This is my website, where the less silly stuff goes.